Liquid medications that can be purchased over the counter from a pharmacy (or via prescription and online) that contain codeine, promethazine or dextromethorphan. These may be purchased as individual medicines and mixed together. Codeine linctus is an opiate that can be purchased from pharmacies for the relief of dry irritating coughs. Promethazine is a sedating antihistamine that can be purchased for short-term insomnia, allergic reactions and travel sickness. Dextromethorphan is a cough suppressant that can be purchased for dry tickly coughs. When these medicines are mixed together to create ‘purple drank’ users can easily lose track of how much of the active drug they have consumed as the liquid is masked by pleasant or familiar flavours from soft drinks. What are the effects of taking ‘purple drank’? These will vary depending on the contents of the drink. However, users have reported euphoric and dissociative effects. The ability to drive may be also be impaired, and young people have complained of ‘memory problems’ after taking the drink. There is a risk of overdose particularly due to the use of codeine, which may be increased when taken in combination with alcohol. This alert is to raise awareness amongst Addaction staff for the potential of young people to report the use of Purple Drank or other mixtures. Ensure that users are aware of the dangers of driving whilst under the influence of these concoctions. In England, 10.4 million people consume alcohol at levels above the UK CMOs’ low-risk guideline and increase their risk of alcohol-related ill health. There are nearly 22,500 alcohol-attributable deaths per year. In 2015 to 2016, there were 1.1 million admissions related to alcohol consumption, of which alcohol was the main reason for admission for about 339,000 cases. The economic burden of alcohol is estimated between 1.3% and 2.7% of annual GDP. 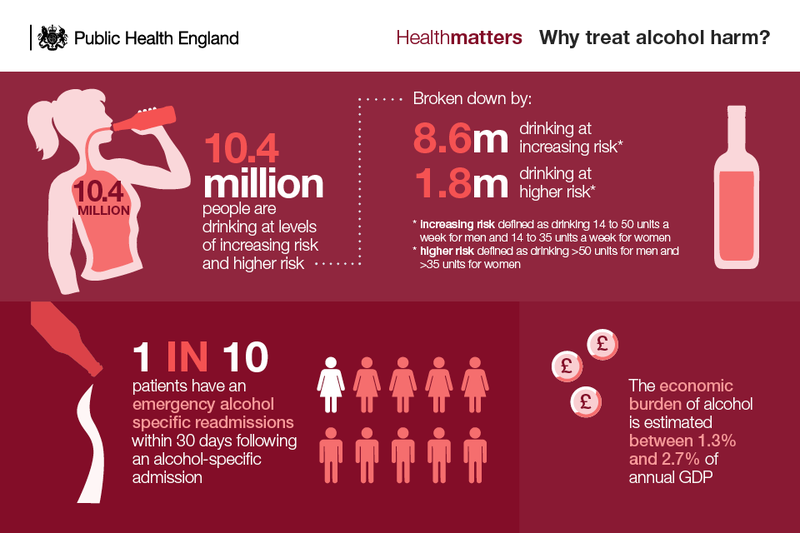 Around three-quarters of the cost to the NHS is incurred by people who are not alcohol dependent, but whose alcohol misuse causes ill health. Alcohol identification and brief advice (IBA) can identify and influence patients who are increasing or higher risk drinkers, but the level of implementation is varied across the country and nowhere near the optimal large-scale delivery required to significantly impact on population health.